"If the stencil is mirrored, meaning that you can "flip" it to create the same design on the opposite side, make sure you mark the railing for each side as they will be different." Do you really need/want to repaint the cabinet? Making the stencils is not too difficult. Here's how I do it. First, take a good look at the machine you are considering repainting and ask yourself if it is worth it. There is no need to repaint a cabinet that isn't damaged or doesn't have severe paint loss. Most people don't mind some wear and tear and a few collectors actually prefer having a game in its original condition rather than restored. If you decide to repaint, then here is how I do it. First, take a good look at the color scheme. Usually there is a base color with two additional colors. Look closely at the colors and determine which order they were applied in. This does make a difference. You can usually tell by looking closely at places where the colors "touch." Original painting was NOT perfect and you can usually see places where one color slightly ovelaps another. The color on top was painted last. Once you have determined the order of the colors, write it down. If you don't, by the time you make the stencils, strip the cabinet, repair the cabinet, and are ready to repaint, you may forget. Trust me, I've forgotten before and had to ask someone else who had the game to "refresh" my memory. Next, take pictures. These will be helpful for at least two reasons. One, even though you will be putting placement marks on your stencils, it helps to have a picture in front of you. Once the cabinet is stripped or only one color is applied, even with the placement marks, a picture is helpful in placing the stencil correctly. Second, the picture can help in finding a color match for the paint. Take the picture with you to the store to help match the paint color. With today's phones having such high quality cameras, it's easy to carry some pics with you and find a match. After getting the color match, I am ready to make the stencils. In making the stencils, first determine how many you will need to make. Some machines have the same design on both sides. Each side is a mirrored image of the other side. For these games, you only need to make one stencil for each color. The stencil can then be flipped to do the opposite side. Note, however, that you will need to mark the position of the rail and cabinet edges for each side as they are different when you "flip" the stencil. 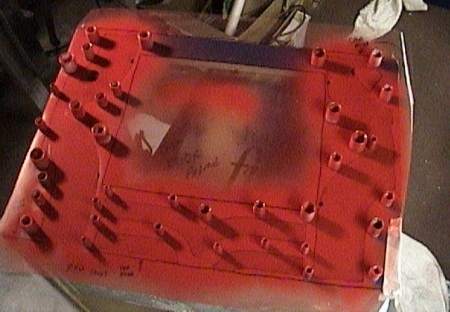 Some machines, such as Gorgar and Globetrotters, require separate stencils for each side as the pattern cannot be "flipped." On these games, think through carefully whether you need to make a new stencil or can just reposition sections of the stencil to get the match. For example, Gorgar is lettered on both sides of the cabinet. While the lettering is the same, its position is totally different due to where the letters are placed on the cabinet. In these instances, you either have to make separate stencils or carefully measure and mark where the different sections go. Consider also whether you will need to have any free standing pieces. Some designs require free standing cutouts to mask areas in the center of the design. 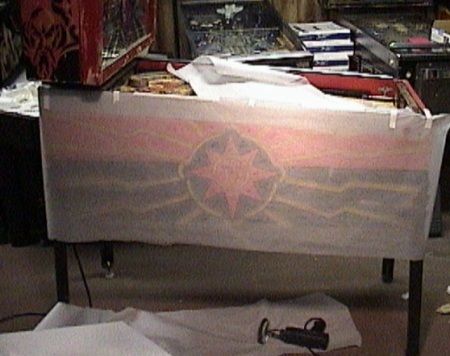 This picture shows the tracing paper attached to the side of my Flash Gordon. 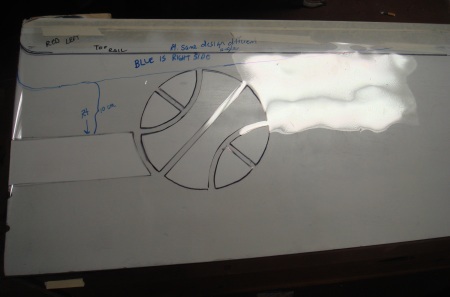 I traced the design onto the tracing paper. However, since this design used a lot of straight lines, I ended up taping off the long straight lines instead of using the stencil (for the line areas). Here, the blue line on the acetate is from the cabinet rail on the opposite side. Then there is a measurement mark below this to help me align it on the other side. In this case, while the stencil couldn't be "flipped," this portion could be. I just needed to measure where it needed to be placed on each side. This is one of those cases that it pays to plan out your repaint before you strip the cabinet. Front Red Stencil for Alien Poker. Here's a view of part of the head on my Harlem Globetrotters. Note that I didn't do the whole HARLEM at once.